Call 1800 659 317 today! 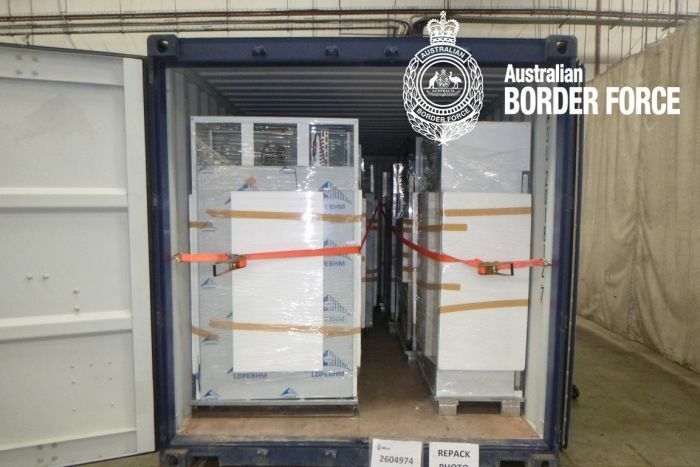 Authorities have launched an investigation after intercepting $438 million worth of the drug ice inside an FCL shipment of refrigerators – which had been declared as ovens. Authorities have intercepted $438 million worth of the drug ‘ice’ inside a shipment of refrigerators. The container, which was shipped from Singapore, was declared on shipping documentation to contain electric ovens. But when examined at Sydney's Container Examination Facility on 30th March, officers found 11 commercial refrigerators inside. X-rays suggested there were inconsistencies with the make-up of the fridges, prompting customs officers to investigate further. After removing the back panel of seven of the fridges, the officers discovered 561 packages of white crystalline substance. Testing later revealed the substance was methylamphetamine, also known as ice. Police estimated the drug shipment, weighing 585 kilograms, had a potential street value of $438 million. It's one of the largest that's ever been seized. The discovery prompted the establishment of a joint investigation involving the Australian Federal Police, NSW Police Force's Organised Crime Squad, and the Australian Border Force. On Friday, police conducted raids on three Sydney addresses — two commercial premises at Wetherill Park and a home at Edensor Park. Officers seized documents and computers during the raids, which are now being examined. The probe has been extended to overseas locations, but at this stage authorities will not specify where. The import smuggling attempt has been described as crude and amateurish, with the drugs disguised in a fairly basic manner. The misdeclaration of the goods was obviously one of the basic blunders. Once again, the lure of a quick dollar has backfired, although no arrests have so far been made. © 2013 - 2014 Alliance Intercontinental Pty Ltd. All Rights Reserved.